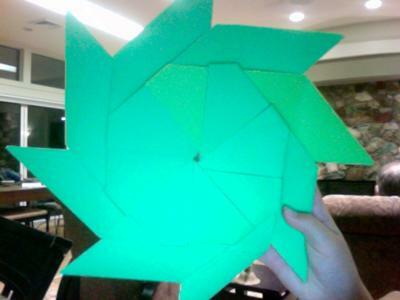 The origami ninja/magic star starts as a circle then morphs into a star when you push on opposite edges. It is made of ten individual pieces and is easy, but takes A LONG TIME!! "I have no idea how to do that CRAZY thing!" wow co cool i couldn't do it! i have accidentally made one of these before i was attempting to make a frisbee! I want to learn how to make that!!!!! That is cool!!!!!! i know how to do it. it's easy, but to takes awhile to transform. Well done, I'm impressed! Keep up the great work!